One of the more common ways to play Dark Souls is bulking up with huge pieces of armor, knowing you can withstand attacks. This isn’t the case in Dark Souls 3, as it appears one of the game’s stats has become pointless. Glitch? Intentional design change? Nobody knows. In practice, it’s supposed to mean the player doesn’t stagger when attacked, and prevents their animations from being interrupted. It’s modified by upgrading stats (in Dark Souls 3, that’s vitality) and equipping rings/armor. This is useful for certain types of PvP builds centered around speed; even if a player can hit you a bunch of times in a row, poise will let you hit back. In PvE, a boss can hit hard and you’ll still be standing. 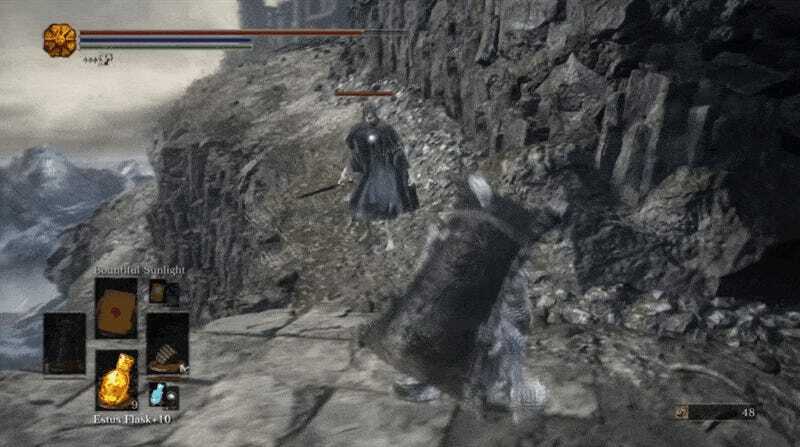 But as you can see in the GIF, the player keeps getting interrupted, despite wearing the heavy Havel armor, the Wolf Ring (which increases poise), and equipping Yhorm’s Greatshield (also a bonus to poise). Between those three, you should be able to withstand some substantial hits, yet they’re unable to maintain composure when facing the game’s earliest enemies. This is a problem because it removes one of the greatest advantage of heavy armor; it could be argued it renders heavy armor mostly useless. As it stands, it appears poise has zero impact on the player, despite what a number of item descriptions suggest about their intent. It would be less of a problem if From Software had communicated these changes, but they didn’t. If anything, the game appears to be intentionally misleading! This story gets stranger, though. Players have started picking apart the code for Dark Souls 3, and discovered a value that seems to turn poise on. The folks who discovered the change haven’t publicly disclosed how it works “due to ‘respect’ for IP/it breaking terms of service and first sale doctrine applying for private use only.” If you were to modify the game’s code and go online, you would be banned from Dark Souls 3 in short order. But its existence is baffling, and suggests Dark Souls 3 really does have a fully working poise mechanic that was either removed from the game or From Software somehow shipped it without flipping the poise stat back on. That’s what poise is supposed to look like—the character doesn’t budge. From Software hasn’t answered my questions about poise yet, nor have they addressed community concerns publicly or through patches.